Have students try these activities to extend their knowledge and interest in Simple Machines. Set up a science center in which students can build and use simple machines. Provide materials for making levers and pulleys. Have students experiment with the amount of effort needed by moving the fulcrum on first-class levers and using fixed and movable pulleys. Encourage students to chart their results. Have students identify dates cited throughout the unit. Ask them to develop a time line citing the dates and the events related to them. Show students how to break the time lines to show long lapses between dates. Have students collect and label examples of simple machines. Encourage them to set up an exhibit in the classroom of all the items collected. They may wish to use photographs or drawings to show examples of such simple machines as ramps or cranes. They could also use models, for example, toy tow trucks, to represent full-scale items. With students, examine each lettered part of Rube Goldberg’s “Pencil Sharpener.” Brainstorm a list of other simple tasks and challenge students to develop an invention that emulates the Goldberg style. Some students may wish to build their invention as well as draw it. Encourage them to do so. Display their drawings and inventions in the school library or media center. Encourage students to use art and words to make up their own word plays. For example, to play on the phrase “threads of a screw,” they might draw a screw with a bobbin of thread as its head or a screw dressed in fancy clothing. Have interested students read our unit on the Industrial Revolution for more information about machines and their use. Have students examine the information about the effort needed to roll a 40-pound drum up ramps. 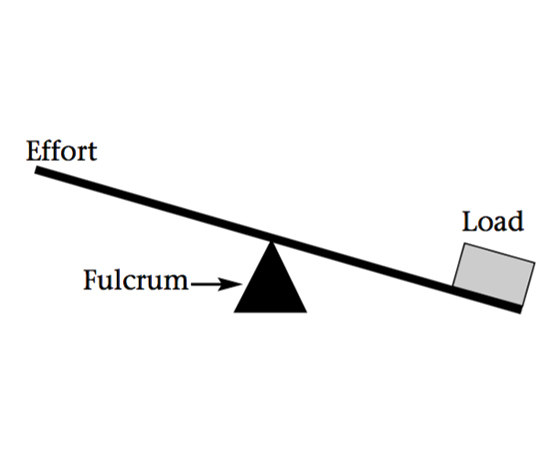 Ask students to use the information to develop a formula for determining the amount of effort when the length and height of the ramp as well as the weight of the load is known. Then have students write problems that can be solved by using their formula. They can exchange papers and solve each other’s problems.